In medium bowl, mix together first set of ingredients to make the peppermint wafers. Set aside. In mixer bowl, beat together butter and sugar from second set of ingredients until fluffy. Add egg and vanilla and beat. In medium bowl, whisk or sift together the rice, tapioca, almond or coconut flour, and xanthan gum until well combined. Add cocoa, baking powder and salt and whisk until well combined. Add the flour and cocoa mix to the butter mix in the mixer and beat until just combined. The dough will be very soft. Now it’s time to assemble the cookies! Take a tablespoon of the chocolate cookie dough and flatten it into a round using the palms of your hands. Repeat until you are out of dough making each round approximately the same size. You should end up with about 48 rounds. Take the peppermint wafer dough – which will also be quite soft – and drop by the teaspoon full onto half of the chocolate rounds. 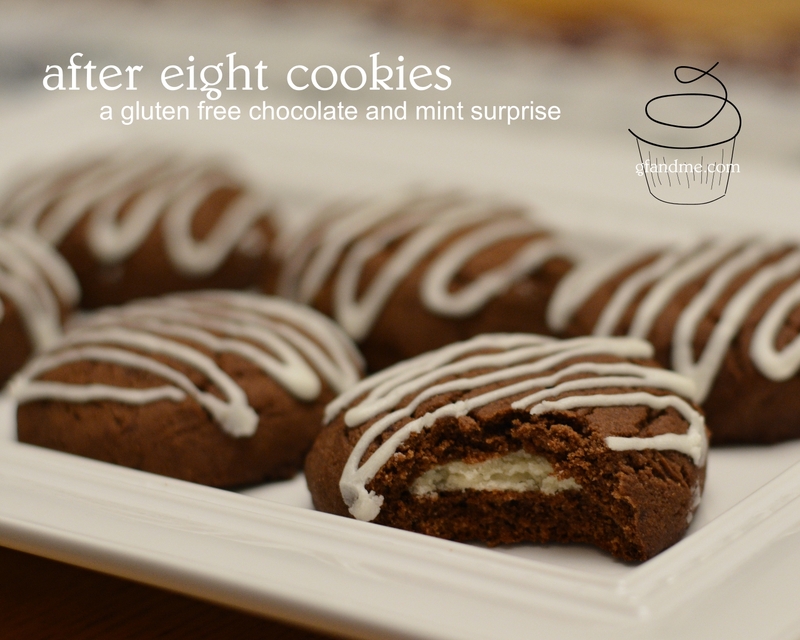 Take the other chocolate rounds and place on top of the peppermint covered cookies. Flatten slightly and press the edges together to seal. You should end up with about 24 cookies. Place on cookie sheets and bake for approximately 12 minutes. In the meantime, combine the icing sugar, butter and peppermint extract in a bowl. Add enough milk to make a glaze. Once the cookies are cooled, pipe the glaze over the tops of the cookies using a piping bag. TIP: If you don’t have a piping bag, put your glaze in a plastic sandwich bag, squeeze the icing into one of the corners to make a cone, and carefully snip the very tip of the corner off with a pair of scissors. Squeeze to pipe the glaze onto the cookies. Place in refrigerator to set. Store in an airtight container for 2 or 3 days on the counter or freeze. Like most things with nut flour, I find these to be best the day after baking once the flavours have really melded. This entry was posted in Baking, Recipes and tagged almond flour, coconut flour, cookies, holidays. Bookmark the permalink.